Following the mysterious release on Monday of a new track, “Julia, (or, ‘Holy to the LORD’ on the Bells of Horses)” and the appearance of a countdown clock heralding a pre-order beginning Friday at midnight on their website, experimental rock act mewithoutYou have revealed two new releases. The band digitally released a brand new EP, [untitled] e.p., today while simultaneously announcing a new album, [Untitled], which arrives October 5, 2018 on Run For Cover Records. Pre-order for both releases is now available. 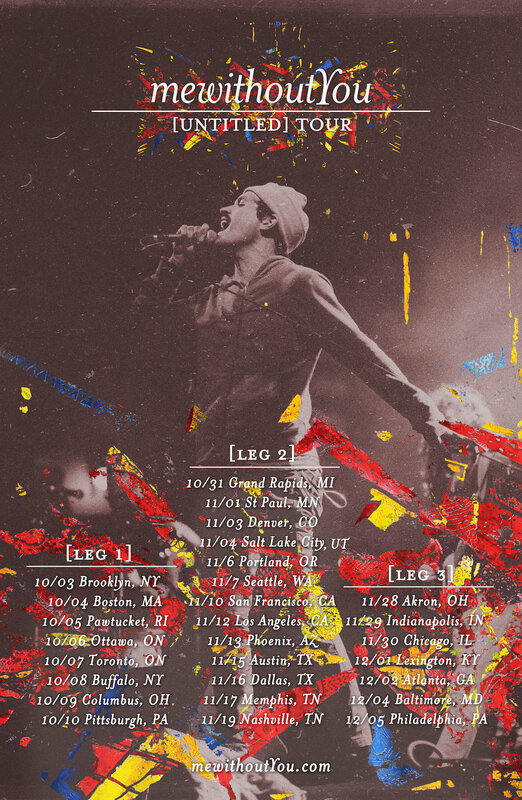 Additionally, mewithoutYou announced a fall US headlining tour in support of the releases today. Pre-sale tickets are currently available, and on-sale starts next Friday (all tour dates below). “It’s a perennial question within the band of how far to push out into the unknown,” says vocalist Aaron Weiss. “Of course it’s nice to do something new, but to what extent, and to what end?” For [Untitled] novelty came naturally. Weiss had become a husband and father and relocated to Idaho, where a makeshift home studio rig and MIDI keyboard facilitated lo-fi, synthetic experimentation. Meanwhile in Philadelphia, guitarists Mike Weiss (Aaron’s brother) and Brandon Beaver stockpiled ideas ahead of the recording session with producer Will Yip. And the addition of Dominic Angelella—who took up bass duties while Greg Jehanian was on sabbatical (he’s since returned to the band)—gave drummer Rickie Mazzotta the chance to spread out and explore a new sonic palette. The result is two works of tragicomic beauty, the likes of which only mewithoutYou could create. The lyrics on [Untitled] are still deeply poetic, and the themes are familiar—e.g., mysticism, metamorphosis, mental illness—but, moreso than recent mewithoutYou albums, are built on Weiss’ lived experiences. He describes his attempts to “go into greater depths of whatever I am and face what’s there—however petty, incoherent or humiliating—and emerge with some reason for hope, a reason for joy regardless. To have that be the takeaway, to stare down my deepest misery and sickness and then find a positive resolution, that’s at least part of what I’m going for.” It’s noticeable in tracks like “Julia,” “Flee, Thou Matadors!,” and “Michael, Row Your Boat Ashore,” as mewithoutYou transmute their most primal urges and “non-drug-induced hallucinations” into expansive, all-consuming compositions that feel outright celebratory by the end. While Weiss may appear to be at the center of the journey on [Untitled] and [untitled], his bandmates trace similar paths forward. Beaver and Mike Weiss craft rich, intricate guitar melodies and psychedelic panoramas that quake deep inside the listener’s chest, while songs like “Wendy & Betsy,” “Cities of the Plain,” and “Winter Solstice” find the band at its most chaotic, meditative, and pop-oriented, respectively. This expansiveness can likewise be felt in the rhythm section, as Angelella and Mazzotta guide the albums through a dizzying array of landscapes, anchoring the explosive moments and giving the ambient sections a propulsive heft. Their finest work to date, [Untitled] and [untitled] secure the band’s position as a pacesetter in the world of thoughtful, aggressive music.